Computed tomography is a powerful means for non-destructive study of the internal anatomy of fossils. However, our tools for using these data are much more refined now than 20 years ago. Restudy of older data in light of this reveals important new anatomy that radically alters our view of the capacity for evolution on the fin-to-limb transition. 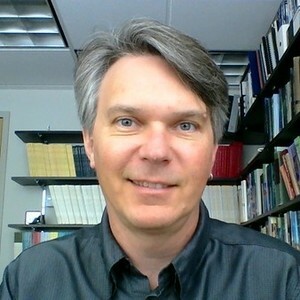 On a Saturday in November 1998, I found myself walking against the crowd leaving a University of Texas football game to get to the Jackson School of Geosciences, located two buildings away from the stadium, for a late morning appointment. The crowd, mostly Aggies fans, were upset because Longhorns running back Ricky Williams had just broken Tony Dorsett’s NCAA rushing record at their expense. One of them noticed my Michigan shirt and belligerently asked when the last time the Wolverines had ever done anything? He had apparently forgotten the national title we shared with Nebraska the previous year. 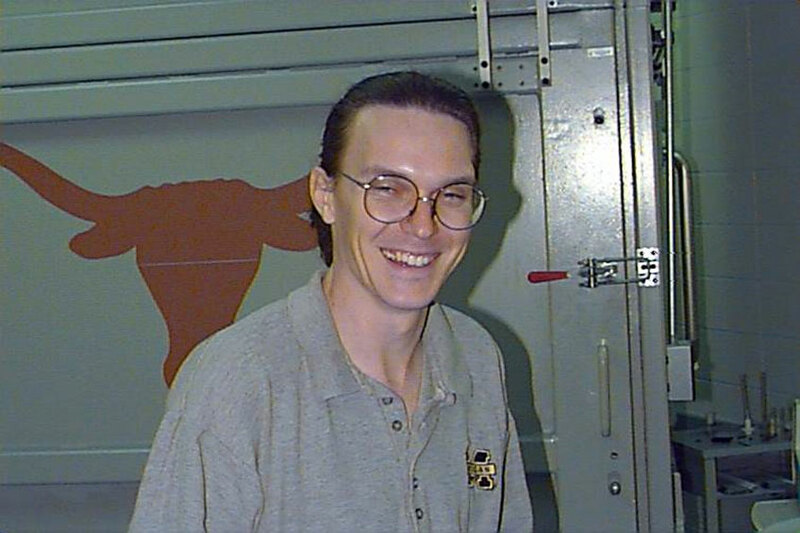 At the UTCT Facility in 1998. More hair, fewer megapixels. The Jackson School of Geosciences is home to the UT CT facility, which at the time was one of the only places one could get a fossil scanned and glean useful data. I was a graduate student at McGill University in Montreal and my thesis project was on aïstopods, an enigmatic group of snake-like “amphibians” from the Permocarboniferous of Euramerica. Most aïstopods are known from layers at the base of formerly mined coal deposits known as “cannel coal”, although at Mazon Creek, Illinois the fossils were found in concretions in sediments above the coal layers. The fossils are usually flattened, and the bone replaced by clay minerals, so the common practice is to remove the clay minerals and produce casts of red latex from the resulting natural molds. Natural molds and red latex casts of aïstopod Oestocephalus from Ohio. This limits the anatomical information available to the more superficial bones, which are extremely specialized in their anatomy, which clouds our ability to properly place them in their evolutionary context. Very little was known of the braincase anatomy as a result. One notable exception to this preservational rule is the first aïstopod, Lethiscus stocki, from the Wardie Shales of the Scottish Carboniferous, which is a three-dimensional concretion that preserves intact bone. It was this fossil, the only known representative of Lethiscus, that I was in Austin to scan. 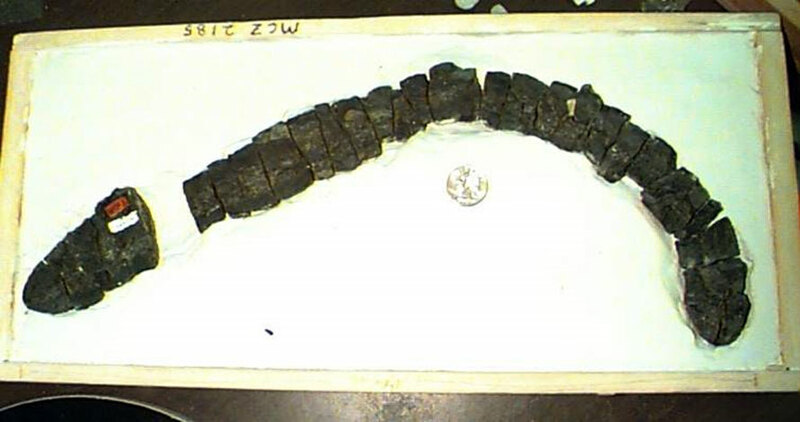 Half of the "sausage": concretion containing Lethiscus, in 1998. Aïstopods have two major constituent groups, the Phlegethontiidae and Oestocepalidae. These two groups are extremely disparate in their anatomy, and there was some question whether they formed a natural group. It was my hope that scanning Lethiscus, being the oldest and thus presumably most primitive anatomically, would help resolve this problem. Moreover, aïstopods were united with a group of similarly small, anatomically advanced (but morphologically disparate) group of tetrapods known as Lepospondyli. Lepospondyls were becoming critical to the question of the origin of modern amphibians, being placed in the crown group (the most recent common ancestor to living amphibians, reptiles, mammals, and birds), so by better understanding the very first lepospondyl, Lethiscus, I hoped that I might gain insight into this larger evolutionary dilemma. Unfortunately, computers were not very capable in 1998 compared to what we have today. I also did not have access to very sophisticated software, and convincing my supervisor to spend a goodly proportion of his annual operating budget on a program for a single study, when he saw no reason to upgrade from MS-DOS himself, was futile. I struggled with the scan data for a few years, eventually published what I could in 2003, and set this dataset aside. Fast forward to a few years ago. Computers have become tremendously more powerful, and software less expensive, more powerful, and much more user friendly. A colleague at the Natural History Museum in Paris, Damien Germain, contacted me about that data set. He was working with synchrotron CT data of aïstopods from a site like Mazon Creek in Burgundy, and took a quick pass at my Lethiscus data, producing models that told me more was there to be learned. My PhD student and coauthor Jason Pardo took this project on as a personal challenge. 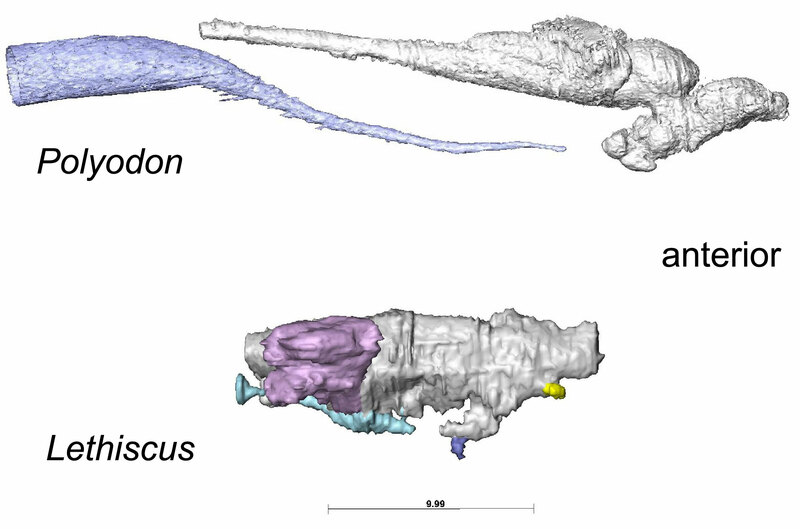 He has a quite sophisticated eye for CT data, and put together the early anatomical models that told us Lethiscus was something quite different than expected. Rather than being close to the ancestry of living tetrapods, Lethiscus had primitive anatomy present otherwise only in fish and the earliest “stem” tetrapods on the fin-to-limb transition. By using the later, better known aïstopods (and only the superficial bones) for analysis of relationships, phylogenetic outcomes were being misled. Recent research has shown that braincase anatomy preserves crucial data for evolutionary relationships, which is a way to get around the otherwise confounding specialized external cranial anatomy. With MSc student and coauthor Matt Szostakiwskyj, we had been constructing a new dataset including important lepospondyl braincase anatomy, and Lethiscus was a crucial representative to include. Seeing how primitive the braincase appeared, I contacted my colleague and coauthor Per Ahlberg at Uppsala University, who has greater expertise lower on the tetrapod tree, and over a sabbatical we went over our findings in Sweden and produced new models, including of the brain endocast. In this, we found an inexplicable “second hypophysis” that nobody could identify, despite presenting the findings at several conferences. Fortuitously, Jason Pardo solved the problem. He had been working on a juvenile extant paddlefish using contrast-enhanced CT, and identified the “second hypophysis” as a remnant of the notochord in the braincase. Brain endocasts of (top) paddlefish and (botom) Lethiscus. Remnant of notochord is in blue, brain in grey, inner ear in purple. Snout is to the right, tail to the left. Courtesy of Jason Pardo. These final data in hand, we submitted our findings to Nature. The moral of the story: never delete digital data. Never throw away old notes. And check the football schedule before planning to go into the lab!